2. Upload your creation to your blog with a link back to us and provide a direct link to the post featuring your challenge submission. 3. Please link your card to no more than three challenges, TOTAL. I have had this idea floating in my head for a few weeks and decided to give it a try before Valentine’s Day was over. Do you remember the Star Kit from the Holiday catalog? Well, I had an extra kit so I gave it to my son to use the stars on the bulletin boards that he has to decorate every month in his dorm (SU kits have been a LIFE-SAVER for him). I had the pieces that attached to the stars left over so I used one to attach two of the black hearts together to make a little open gift box. I will put some candy in it and give it to my daughter on Valentine’s Day. It is Sale-A-Bration Time! What does that mean? For every $50 you spend – on ANY stamping products (yes, even products on sale) qualify for a FREE Sale-A-Bration item!! Plus, your order over $150 will still qualify for Host Dollars!! To make it even better, if your workshop or personal order is over $250, Stampin’ Up! will give you an EXTRA $25!!! Contact me to get a workshop scheduled! I would love for you to get the wonderful benefits of your friends’ enthusiasm for this great sale! NOW IS THE TIME to get together with your friends and have some crafting fun! Click on the catalog covers to the right or on my SALE button and see all of the great products! If you would rather have a catalog that you can hold in your hands, contact me and I will send you a catalog FREE. When you place an order and qualify for a Sale-A-Bration item, I will send you another product FREE! For every $50 of product purchased (before shipping and tax), you earn 1 SS Reward. Product totals exclude shipping & handling, sales tax and any amounts paid toward items in the host rewards program (including supplements to Hostess Dollars and 50% off items). You still earn host rewards for product orders over $150. YOU are responsible for tracking your orders and SS Rewards. Once you earn 10 SS Rewards, email me at [email protected] with your merchandise totals and the stamp set (must be less than $25. Host stamps are excluded) you would like to order. I’ll confirm your qualifying customer orders and send your free stamp set of $25 or less (please allow 2-3 weeks for delivery after the order is placed). SS Rewards do not expire as long as I can verify your orders through Stampin’ Up! This program begins with orders placed after January 1, 2014. Paper Pumpkin Pre-Paid Subscription SALE! PP is a great way to craft and the 3 month pre-paid subscription is only $54.85! That’s $5.10 off the regular price!! Exclusive, quality products with everything you need included in the kit! Give it a try! If you don’t like it, I will buy the kit from you. Details about the subscription are HERE. Ready to sign up for this no risk, fully flexible program? Join Now! Weekly Deals: Brand new Sale every week!! Check out the latest group of products on sale HERE! Click on theStampin’ Store in the top menu or the SHOP button on the sidebar to see all of Stampin’ Up!’s latest and greatest promotions! Gift Box, Hearts Framelits, Hello Life, Stacked with Love, Valentines, You Plus Me. Bookmark. Beautiful projects, Debbie! Great way to highlight the DSP stack and the companion stamp set. The heart box is over-the-top fabulous! Beautiful! Your heart box idea is brilliant, and oh-so-lovely! 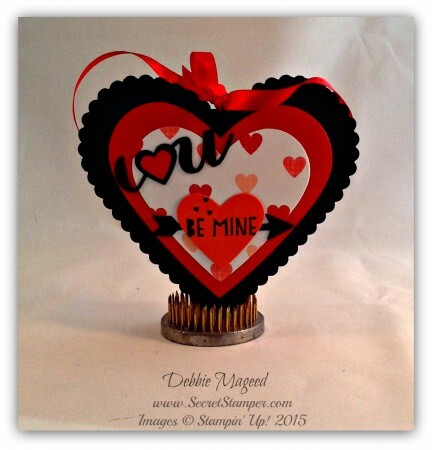 Debbie, I love your beautiful card but the heart shaped treat holder is fabulous! Your daughter is going to love it! Your card is fabulous! Love it to pieces! But your little heart box is over the top! What a fabulous idea! What fun projects! I love how you used the challenge colors.Adorable! Wonderful projects, Debbie! I love the way you’ve used the challenge colors and that heart box is so adorable! Your card is so bright and cheery! I love the way your combined the colors!! And your gift box is sooo adorable…! What a perfect balance of the challenge colors, Debbie! I love this layout. Of course, the coordinating heart box is adorable! I’m late with my comments on this challenge – two great projects though! Love the card and the mix of colours and patterns and the heart box is just fabulous!